Frans Bleiji, born, 6-11-1950 in Leiden. 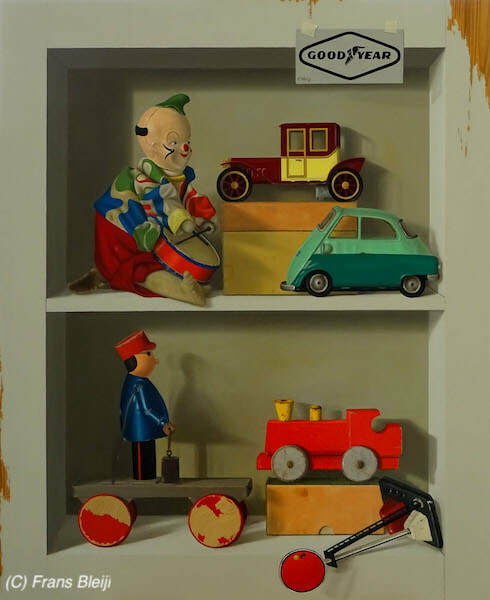 He made his first steps in art in 1984 at the Volksuniversity in Vlaardingen, his teacher noticed the progress he made in a short time and gave him the advice to start a education at the Academy. So he did in 1986 at the Royal Academy of Art in The Hague. In the second year he finished it because the lessons became too abstract and such won’t fit at his way of working, so he was going his own way and became a self-thaught artist. A note about his work (trompe-l’oeil). Have objects been stuck on or pinned to the canvas. It certainly seems like it; you bend over and involuntary want to feel with your fingers whether the push pin has or has not actually been inserted into the canvas. It hasn’t. One of many notables reactions to Frans Bleiji’s work, referring to the use of trompe-l’oeil. 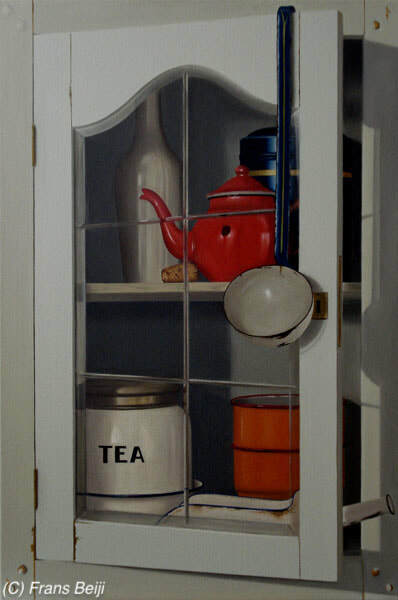 While using the techniques of chiaroscuro and especially trompe-l’oeil, Frans succeeds in breathtakingly capturing the essence of the subject and the underlyig thoughts. 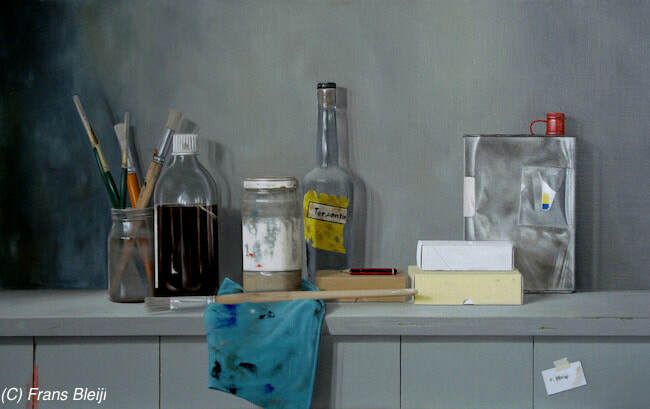 But he is not an artist who likes to tie himself down to one particular way of working although his approach should always contain an aspect of realism. Whatever course he chooses to pursue, realism will always be part of the new route. For example, his recent work is a fusion of “work after Mondriaan” and realism in a series of work he would like to call “hand in hand”. 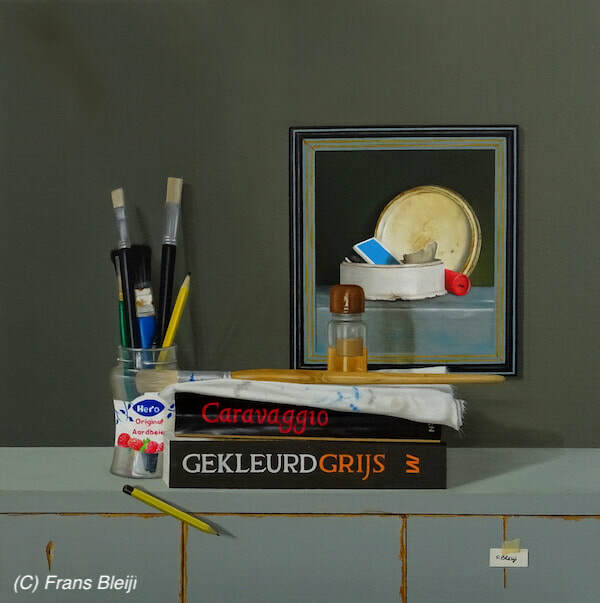 And no matter what he produces, the same things always seems to come together in his work because of the fact- and this is certainly worth mentioning here- that Frans is always searching for the third dimension on the flat surface, which why he was given the nickname “the shadow artist” in a newspaper article. 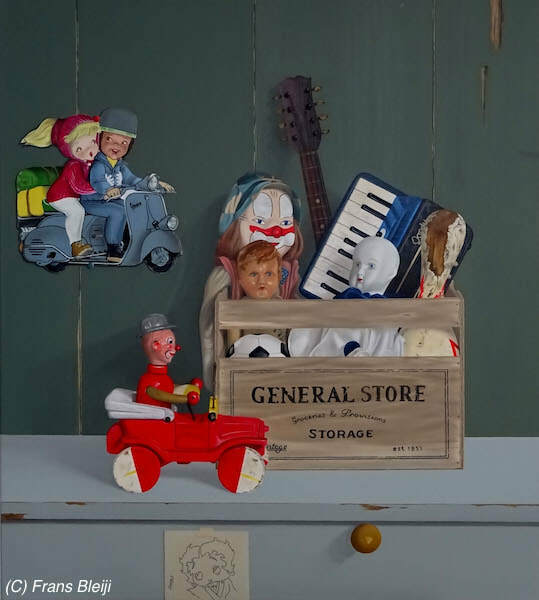 Frans is a self-thaught artist who, after studying at the Royal Academy of Art for more than a year, decided to teach himself everything he needed to know as he felt that the route followed at the academy was not his. Work in private possession in; Netherland, Belgium, France, England, America, Ireland, Curacao and Switzerland.